Authentic Peruvian fare with an emphasis on local and sustainable products in Paso Robles. 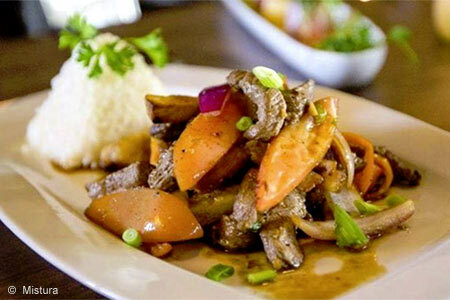 : Mistura offers vibrant Peruvian dishes. All but the most adventurous diner might steer away from the beef heart and alpaca sliders, but everyone else can find something to tuck into, whether it’s the empanadas made with grass-fed beef, house-made Maine lobster ravioli, or free-range organic lamb shanks marinated overnight and served with Peruvian yuca and beans. For dessert, go for the mango crème brûlée or the guanabana (a Central/South American fruit) panna cotta. Beer and wine are available. Mistura is located just off Highway 46 East at an executive golf course in a residential community, so there’s ample parking and panoramic views.